Basia Smolnicki is a Wellington based printmaker and artist, known also for her etched glass and metal work. Basia now has her studio at her home in Newtown. There is a small old-fashioned hand operated press at the back of the room. The main wall is surprisingly free of images. 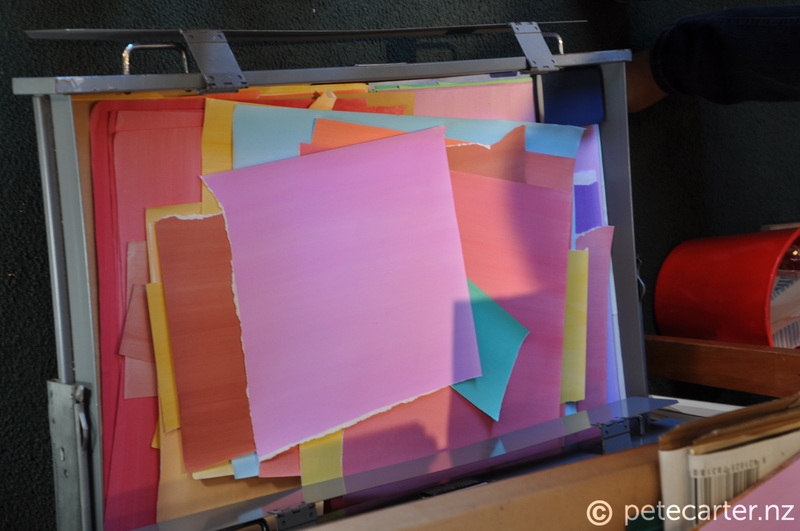 Propped up on the work surface that takes up one side of the room are prints and woodcuts and different coloured papers. On the other wall there are pinboards with colour charts and stencils of images. An array of neatly lined up implements, almost like a surgeons or a dentist. 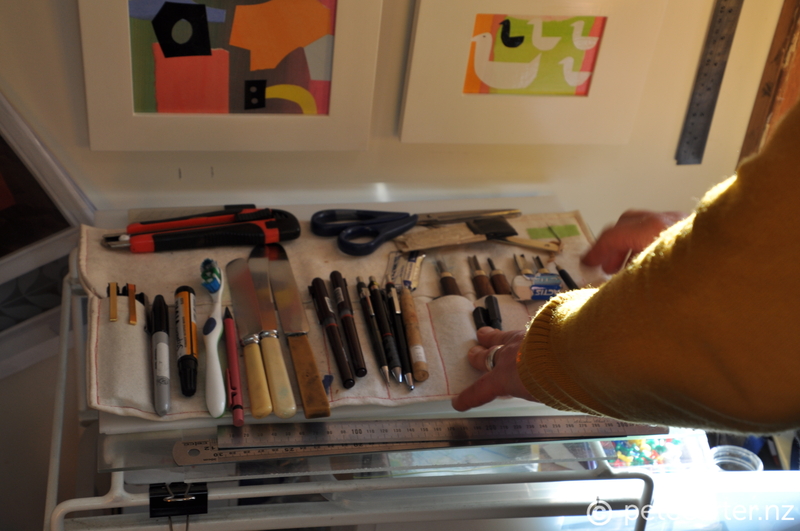 There are scalpels, Stanley-knives, pencils, pens, hole punches, a set of three old bone handled kitchen knives, even a toothbrush. The space appears to be very organised, though she admits she tidied up for our interview. 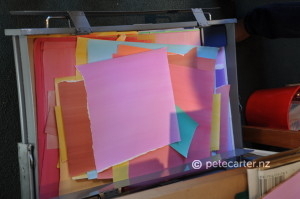 She showed me a draw full of hand painted paper, ready to rip, cut and paste. The colours are pure bright pastel. They contrast starkly with some of the stencilled images, boats, flowers and this being New Zealand – birds. There are not many artists in this country that don’t use a bird as a metaphor. Basia is tall and poised, she appears calm and controlled. 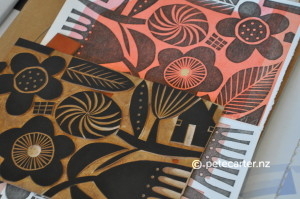 I asked her if she saw herself as a traditional printmaker, she agreed though with the clarification that she used old techniques with modern ways and a much broader array of materials that are now available. 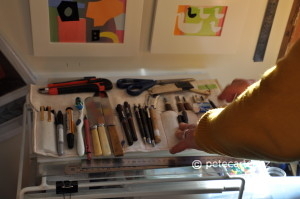 She references Matisse and his late life stage of “drawing with scissors”. John Drawbridge taught Basia back in the eighties at Wellington Polytechnic, he described her work as very Polish. It took Basia years to realise that this observation meant more than her heritage. 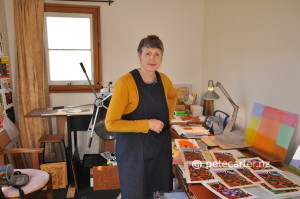 What John was really observing was her acknowledgement of paper cutting, her simplification and the humour in her work. Basia was born in Petone, the second youngest of five children. Her mother came over from Poland as a child, part of the Pahiatua group. Her father served in the Polish Free Army and after the war worked on a hydro scheme in Tasmania. He became Basia’s mothers pen friend then came to visit her in New Zealand. The rest you can guess. The family grew up relatively poor but there were vegetables in the garden, fruit trees and grape vines. Basia’s Dad made vodka from the potatoes and wine from the grapes. Furniture was often home-made, clothes were mended and handed down. This upbringing informs Basia’s work, the desire to recycle and re-use. The pulling together of parts. The Polish community in Newtown was very important then. Polish lessons as a child took a backseat when netball became more important. The community and the heritage are still important. She and her husband Paul traveled to Poland shortly after Lech Walesa and Solidarity arrived. Music too is important. She and Paul are in a band. Basia on piano-accordion, he’s on ukulele, the band are called Thirsty Thursdays. The family is still close, her mother is alive and well and living on her own in Petone and all four siblings are no more than an hour away. Paul and Basia’s three grown up sons are close too, the youngest returns whilst we’re sitting outside enjoying the mid-winter sun. He starts preparing the family dinner, frying onions waft through the French doors. Wellington is well and truly home. This city might be home but Basia is well travelled, she studied paper making techniques in Japan, and following further study in the US completed a post graduate diploma at the Camberwell School of Art in London. Basia’s glass work started when she worked in collaboration with her architect husband, Paul Kerr-Hislop. Etching glass for an internal wall. This has progressed and she has kept pace with new technology, working closely with several small firms of craftsmen, mainly back in Petone. Firms that undertake laser cutting and sand etching for example. There is a beautiful example of one of her bowls currently at Solander Gallery in Wellington. As an artist she divides her time three ways. A third of her time is spent teaching at The Learning Connection in NaeNae. One third is spent etching glass and preparing for sand blasting and the remaining third print making. Basia seems content with this arrangement, enjoying the creativity and energy of teaching young students whilst having time to create her beautiful, spare, pieces; full of light and colour. Basia’s work is available at the Solander Gallery and at Paper Works. The Art Library has a small selection available for rental. This article is the first of an intended series of profiles of artists and those that are involved in the art world. Sponsored by The Art Library Ltd.
Great article and well done, I have always thought it would be wonderful if someone wrote about the amazing artists that live locally. I look forward to more. 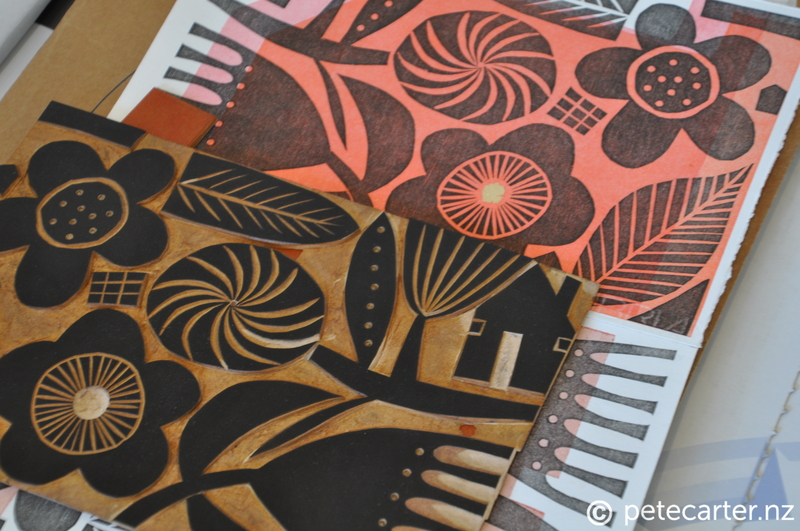 I am sure that you have more than a hatful to interview, but can I put forward Marci Tackett, an incredibly giving person like Basia – Marci also tutors at TLC – and an artist dedicated to her printmaking process.